Died Wednesday 31st. January 1917. Harry (baptized Walter Henry), son of Frank and Alice Howard, was born on 7th May 1890. His parents, originally from Leicestershire, had moved to Codnor Park, Ironville, where his father took up employment as a Forge Labourer at the Butterley Company Forge. The 1891 Census records the family as living at Queen Street, Ironville as follows :- Frank (age 37), Alice (37), Thomas (13), Walter Henry (11) and Ernest (5). 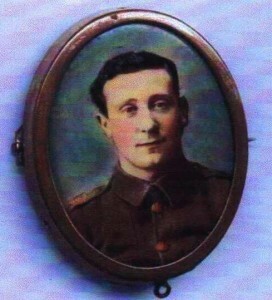 Harry enlisted at Ripley, Derbyshire and was already serving as a Private in the Army when war broke out in 1914. His company, The Ripley E Territorials, was posted to France on 26th February 1915 and Harry gained his stripes whilst serving in the field of action. He was a well known local footballer and cricketer, playing for the ‘Ironville Bible Class’ Football Club and Codnor Park Cricket Club. Whilst serving in France, he had also played football and cricket for the Battalion elevens. Harry was killed in action on Wednesday 31st January 1917, aged 26. He was awarded the 1914-15 Star, the Victory Medal and the British War Medal but his Medal Rolls Index Card indicates that his medals may never have reached his family as, in January 1922, the army requested permission to dispose of his medals. Private 2002, Joseph Raybould was serving in the same battalion, lived on the same street and was killed on the same day as Harry. They are buried almost side by side at Foncquevillers Military Cemetery, Pas de Calais, France in Plot III C. 1. (Raybould) and Plot III C. 4. (Howard). L/Sgt Howard & Pte Raybould are both listed on the Jacksdale and Ironville War Memorials. 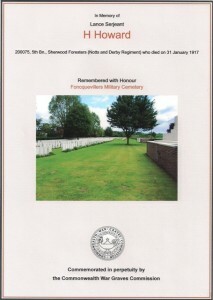 During the summer of 2001, Judith and Terry Kelsall, of Mackworth, Derby, were kind enough to take photographs of L/Sgt Harry Howard’s and Joseph Raybould’s graves, whilst attending the 85th Memorial Service to commemorate the special connection which exists between the village of Foncquevillers and the city of Derby. Foncquevillers Cemetery commemorates 648 WW1 casualties (53 unidentified), many of whom were Sherwood Foresters. The village of Foncquevillers was later adopted by the city of Derby.